If you are a small business, freelancer, consultant or any professional who receive money from all over the world then Payneer can be a good option for you. 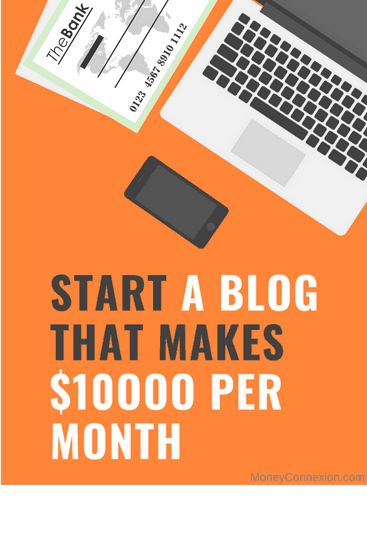 Well I have been working as a freelancer online for 10 years now. In this line of work you don’t need to see your employer face to face because you work from home. So for payments they pay you online through wire transfer. Every freelancing job involves online payment. My first online payment company was through PayPal. But the deductibles were very high so I started looking for other online payment services. I found out Payoneer, another popular online payment company. After using it for 2 years now I found out both PayPal and Payoneer have advantages as well as disadvantages in them. So I decided to write an article putting Payoneer in the spotlight and comparing it with PayPal. Payoneer works just like PayPal or any other online payment company. You go to the Payoneer website, sign up there (we discuss in next paragraph) and create an account. Once you have created your account with Payoneer you can send Payoneer identification account number and routing number to the company that needs to pay you. For example right now I am working as a freelancer with Elance, I will give my Payoneer account detail to Upwork and all my due payments will be sent to my account. So Payoneer is a bridge between you and your employer. Here is the list of some services you can use with Payoneer. Upwork Corporation and more than 2000 companies. 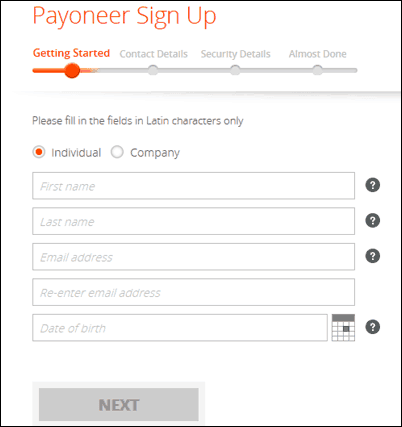 Creating account with Payoneer is very simple. Visit this Payoneer Signup Page & click on Signup. You will also receive a signup bonus of $25. You can join as an Individual or a company. If you are a professional without any registered company then choose Individual. Almost Done: Enter bank details, check the TnC check box & click on Submit. Fill up the information correctly and you are done. Then your application goes for the review process and after weeks they send you email confirmation. Once your account has been created you login and send a payment request to the company you wanted to withdraw your money from. While requesting payment you have to keep few things in mind. Payment Types – It means the party you are going to receive your payment from. You have to choose one from the dropdown menu. Mine was Elance. Payer Details – Fill the details about the payer in my case it was again Elance. Click Pay Now and you will be paid through the Payoneer right in your back account. In last paragraph we saw transferring money to your local bank account. You can also activate your prepaid master card. You can use the card at ATMs to withdraw cash. You can load money using Visa or MasterCard to your card. However there is a daily cash withdrawal and purchase limits. For every transaction Payoneer is going to deduct money just like PayPal or any other wire transfer service. Although fees keep changing but we are giving you latest figures that were available the day we wrote the article. There are three ways you can withdraw your money through Payoneer. For each of them Payoneer charges a fee whenever you make a transaction. $5 for Card Activation in US and $10 outside US. For Loading Payment (Standard Edition) it is $1.5 and for Immediate it is $4 each time payment is loaded. ATM Withdrawal for Per Transaction in US is $1.35 and outside US $2.15. This is the most popular way for transactions among users. For every bank transfer the Payoneer is going to charge $2 for every $100 you transfer. So for example if you want to transfer $1000 then you have to pay $20 in transaction fee and you receive only $980. For less than $75 it may charge $3 per transaction. It has been said that Payoneer could be a replacement for PayPal. Those of you don’t like using PapPal because of transactional fees can go for Payoneer. So let us do small comparison between Payoneer and its competitor PayPal. When it comes to global transaction that means people living outside US then Payoneer is better than PayPal. For every transaction of $100 in India you can save up to $3 using Payoneer. PayPal would charge $5 every transaction (Plus extra charges) on the other hand Payoneer will deduct only $2 (if amount is over $75). Unlike PayPal, in Payoneer there is no manual work required like initiation. PayPal takes 2 to 4 business days for transferring money to your account however Payoneer takes only 24 hours. So Payoneer is smoother than PayPal. Moreover daily withdrawal amount is also higher for Payoneer compared with PayPal. In Payoneer you can withdraw up to $5000 every day. Moreover Payoneer India is offering extra $25 bonus for every sign up. So these are advantages of Payoneer over PayPal. However a review is not complete unless I give you other side of the picture. Sometimes it happens that Payoneer withholds your funds and does not pay on time. Their customer service is also not good if you are living outside US. So these can be few issues with using Payoneer. Finally I would suggest you to use both of them. If you trust PayPal then continue with it. 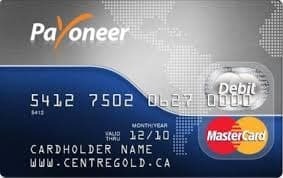 However you want to save money then Payoneer can be a better choice. Try to give a shot to Payoneer & check what can it do for you. In lixsense whil updating payment method with payoneer, i have been asked that i sould have to maintain minium $ 50 with payoneer.is that true .if it is then i m not intrested for this site. Have been using Payonner since 2012 and I found them as the most reliable payment solution for me. I get paid easily from freelance marketplace Fiverr and UpWork. I get deposited to American bank account associated with Payoneer account. One of the biggest issues with Payoneer is inbound payment inconvenience. Those who pay from outside Payoneer will often encounter card payment/transaction failures before they figure out how to do it properly. This issue doesn’t seem to be the case with Paypal and other competitor services. A client is now trying to pay me with his card but struggles to do so, encountering multiple transfer rejections. Have also heard a lot of complaints regarding the same issue from other users. On the user side, it is very simple to use. The fees are reasonable and it has a great mobile app. I hope they will loosen the rigor on inbound payments and increase the payment success rates. The amount of time you will spend configuring the Payoneer platform is massive. You wont be able to get your money right away because they have a lot of “processing” at their end. Transferring your money to your bank account theres a minimum amount you can transfer, believe me its a pain. Very informative because I wasn’t quite sure how the procedure of getting paid works with Payoneer. This article explains it step by step and to the point. I have now registered for a Payoneer account. Thank you. Payoneer is a one stop account sign up organization where you get most of your banking business done n you get connected to ur local and intertional bank on matters of funding and banking solutions. Hello there, my name is Patrick and i am a Payoneer customer. I have been using their mastercard and online account for close to 2years and i can tell you that it is one of the worst online mass payout platforms so far. Their customer support is a huge joke, their online support structure needs to change as you can not get through to online personnel without waiting for close to 1 hour. the personnel don’t understand their jobs and never give you a reasonable and satisfactory response to your issues. Please don’t even bother using their email service, it’s one of the worst ever. I cannot recommend this platform to any one looking for a payment system that is reliable. However, i am closing my account with them today. I can handle the time wastage, psychological trauma and non- responsiveness of their personnel. Highly unprofessional. I am opting for the wire transfer option , even as it costs me $30 per transaction, i get my funds as at when due. Am from India how can i use this card in my country. I am a house wife and a mother of two small kids. Daily I have two to three hours as leisure time and I want to make use of it. I am a graduate in English literature and I have good typing knowledge. Please help me by offering some suitable work. Thank you. I think payoneer is the best,therefore i will like signup with payoneer soon.i notice that payoneer has more security facilities than paypal.Thankyou! 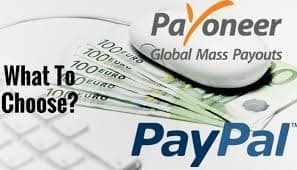 The facts and tips have been told in this article really worth for me because I was thinking to create an account in pay pal that will really help me to choose either PayPal or payoneer.